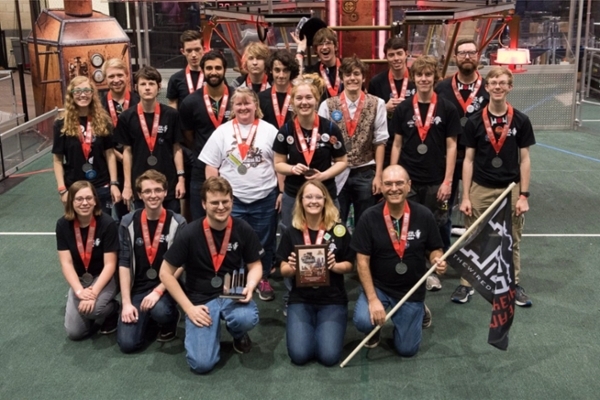 Wilmington, NC - April 3, 2017 - The Wired Wizards , a high school robotics team that participates in FIRST Robotics Competition (FRC), won late yesterday evening the Engineering Inspiration Award at the FIRST North Carolina District Championship, qualifying them for the FIRST World Championship in Houston, Texas. They were one of two teams to win this honor out of the 32 that attended. Sam Weaver is a student on the Wired Wizards that attends E. A. Laney High School. He explained, “It truly has been an amazing season, and getting the opportunity to go to Worlds [sic] has just been icing on the cake!” He could be seen crying tears of joy as he accepted the award with his team. The Engineering Inspiration award is the second highest award offered by the FIRST Robotics Competition at each of its events, and “celebrates outstanding success in advancing respect and appreciation for engineering within a team’s school or organization and community.” This is the second season the team has won this award, and it has largely been a result of the teams nonprofit work with their 501(c)(3) Port City Robotics. Port City Robotics starts new robotics teams and supports local robotics education inside and outside schools. In December, they hosted RoboCon, the largest robotics showcase in southeastern North Carolina.